Let's Go Bears. This website has been created and maintained by Chicago Bears Writer and Chicago Bears Historian Roy Taylor. Also check out our Chicago Bears Tailgating information. 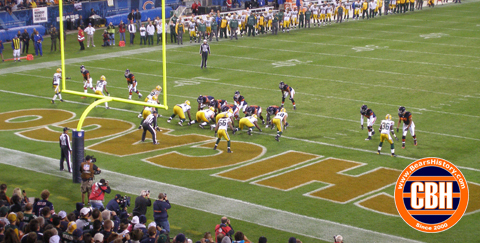 The author of this site is available to give presentations to libraries or other organizations on the Chicago Bears and Chicago Bears History. Follow the link for more information on hosting the author as a Chicago Bears Speaker for your event or organization. Right here, you'll find more detailed information on the 89 seasons of Chicago Bears History than anywhere else on the Internet. The Sidelines contains information that can't be classified in other sections. Uniform history, general "Bears bits" and other information is here. COPYRIGHT NOTICE/DISCLAIMER: This website represents a lot of hard work by a passionate Chicago Bears fan. It is my sincere hope that you enjoy browsing this information on the Bears past. Maybe it will just bring back some great personal memories, or help you settle a bet. I'm not a professional journalist-but it has helped me keep the communications degree I never used professionally fresh. However, the fact that I'm not a professional does not give anyone the right to rip me off. All of these original articles are protected by United States Copyright Law. If you would like to reproduce my work, please contact me and usually I'm more than willing to help you if you cite me as a source. If you are a professional journalist and you pick up a little tidbit here for your story, it would certainly be of common courtesy for you to mention this site as your source.